Heavy metals are one of several possible contaminants in cannabis and cannabis products, in addition to pesticides, microbial organisms, and residual solvents. 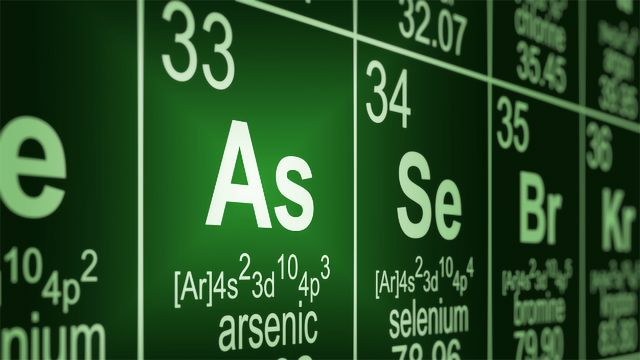 The key metals of interest are cadmium (Cd), arsenic (As), lead (Pb) and mercury (Hg). These four heavy metals fall into the US Federal Drug Administration (FDA) Class 1 category, which lists substances that are “human toxicants that have limited or no use in the manufacture of pharmaceuticals.” Heavy metals are known to be highly toxic, especially because the body is unable to remove these metals efficiently after exposure. The metals accumulate over time, so frequent, extended exposure is a major concern. Although studies on heavy metals contamination in cannabis, and direct studies on the health effects of such contaminants from cannabis, are currently lacking, the FDA recommends that “these four elements should be evaluated during the risk assessment, across all potential sources of elemental impurities and routes of administration” for all drug products, drug substances, and excipients. As cannabis becomes a more prominent commodity in this category in North America, government oversight at the local, state, and federal level is becoming more prevalent. While the recent legalization of cannabis products brings federal oversight to cannabis in Canada, it remains a Schedule I substance in the US; since regulations are instead introduced at the local and state level, testing requirements can vary significantly from state to state, and even from city to city. Studies on heavy metals contamination in cannabis, and direct studies on the health effects of such contaminants from cannabis, are currently lacking. Although not unknown, cases of serious heavy metal toxicity from cannabis are rare, particularly as many states with some variation of legalized cannabis have already implemented heavy metal testing and follow the guidelines of the FDA. Dr. Chris Hudalla is the Founder and Chief Scientific Officer at ProVerde Labs and has been instrumental in bringing cannabis testing regulations to Massachusetts following its legalization for medicinal use in 2012. 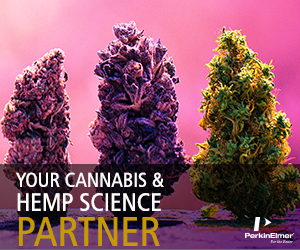 Dr. Don Land is a Professor of Chemistry at the University of California Davis and the Chief Scientific Advisor of Steep Hill Labs, which began in California and now runs cannabis testing labs across North America and Europe. “In states where heavy metals testing is required, we’ve seen very low contamination rate - nowadays typically less than 1%,” says Don Land. Due to their potentially harmful health effects, many states and jurisdictions are requiring the testing of cannabis products for metals. Cannabis plants fix metals from their environment within proteins and fluid within the plant. Download this poster to learn more. The equipment that is used during processing can transfer contaminants to the product if producers are not cautious. “Most of the contamination we have seen does not come from the cannabis itself, but rather through the processing process.” Chris Hudalla of ProVerde Labs says. Another potential source is soil amendments and fertilizers. “Even though these may test below acceptable limits in batch tests, continuous, repeated application can lead to accumulation of heavy metals above the limit in the plant,” says Chris. This is where Steep Hill has seen contamination originating most in its labs: “For most of the cases I’m aware of, violations have come through some sort of soil amendment or treatment that was contaminated,” says Don Land. 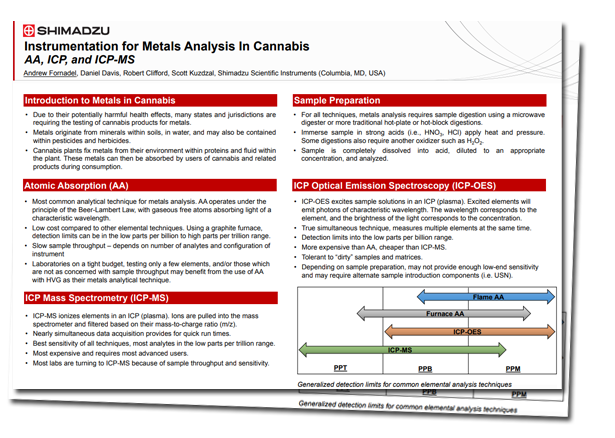 There are several ways heavy metal content in cannabis products can be measured, with the main methods being inductively coupled plasma-mass spectrometry (ICP-MS), inductively-coupled plasma-optical emission spectrometry (ICP-OES), and atomic absorbance spectrometry (AAS). The instrumentation used by both ProVerde and Steep Hill, ICP-MS, is generally considered the gold standard, as it offers the best sensitivity - it is capable of reliably measuring metal concentrations in the realm of parts per billion. The sample is first digested in strong acid before being ionized at high temperatures. While the instrument is highly reliable once properly installed and with proper staff training, this can be a significant financial investment for labs. “Ideally you would have two of them, so you can keep testing in case one breaks down,” says Don Land. Testing for contaminants like heavy metals is vital for advancing cannabis research if the industry is to keep growing sustainably, and producers and consumers rely on labs with cannabis expertise to provide this service. “It’s a long process to get a legitimate lab up and running. The cannabis plant is extremely complex, and all of the methods we use, we’ve had to develop ourselves,” says Don Land. “Labs are often competing when it comes to turnaround time, but producers should be leary of labs that offer turnaround times of less than 24 hours. It’s nearly impossible to do thorough testing on everything that quickly.” The added cost of heavy metals analysis could be a factor for producers who are focused on profits, and there can be a lack of transparency in the legitimacy and quality of test results presented to consumers. “It can be very hard for a consumer to tell if test results are legitimate, so I would recommend that they always check that a product has been tested before acquiring it, and also verify the results instead of relying on producers to abide by the standards,” says Don Land. 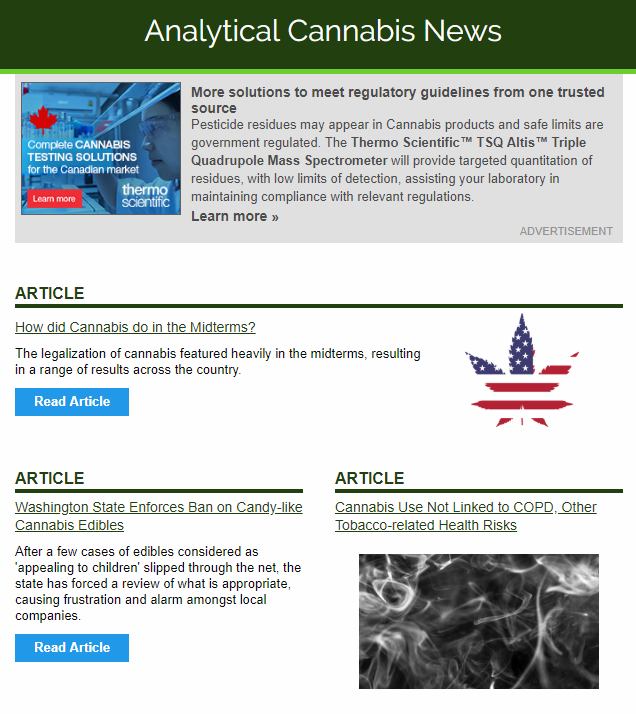 Most regulatory authorities, including the state of California Bureau of Cannabis Control, will not accept results from labs unless they hold ISO/IEC 17025 accreditation, which is the international standard for good lab practices to consistently produce valid results. Consumers should verify a laboratory’s report and check that the laboratory has an accreditation appropriate for the testing they are providing. “Verifying that accreditation is very easy,” says Chris Hudalla, “and one of the best ways that consumers (and regulators) can have confidence in the data that appears on an accredited laboratory’s certificate of analysis.” Consumers can verify ISO/IEC 17025 status through the lab’s accreditation body, for example Perry Johnson Laboratory Accreditation, Inc., which accredits ProVerde Labs, or The American Association for Laboratory Accreditation (A2LA), which accredited Steep Hill’s new lab in Pennsylvania last year.